Hey, friends! Today I’m so excited to bring you the very first episode of Coffee Chats with Kristen! Similar to my Candidly Kristen segments, these chats are casual and about a specific topic (instead of life-updates like ‘Candidly’s), but I have a special guest with me! My mom will be leaving for Spain this week to start walking the Camino de Santiago! This journey is the topic of today’s Coffee Chat, so be sure to watch or read to hear all about it. I know it’s a longer video, but there was too much goodness to edit it down more! This post goes through the same questions I asked her in the video, and I left the time markers for the start of each question in the video if you want to skip around! At the end of the video, (starting around 6:57) she shares some incredible advice for anyone who may be experiencing a tough patch or preparing for a hard journey in any area of their life! 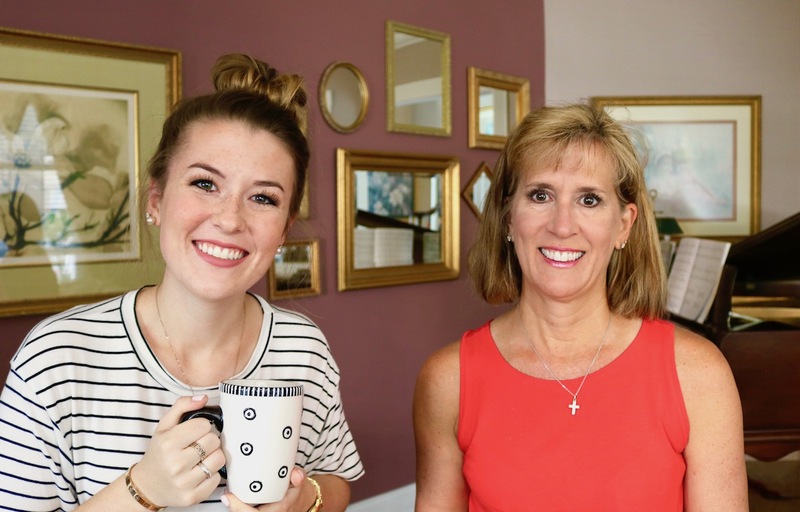 WATCH: Coffee Chat with my Mom! About a year and a half ago, my mom was at a wedding where some other people who had recently done the Camino were talking about their experience. After hearing about it every so often as a Catholic (with lots of Catholic friends), it then struck her that this was something she wanted to do. In such perfect timing, a close family friend of ours (a Catholic radio host who organizes many trips and pilgrimages – see his website here) started planning a group to start the Camino this year. With this group as an easier way to tackle the Camino (with someone to plan the trip for the group, instead of planning it all herself), she knew this was her chance to sign up! The Camino de Santiago is about a 500 mile walk through Europe, following the ancient routes as a pilgrimage to the Cathedral de Santiago, the shrine on the coast of Spain where St. James is buried. The walk itself is called ‘the Way’ and has become a spiritual journey for many Catholic, Christians, and non-religious. Some choose to do the walk and carry all their possessions with them, staying in hostels or hotels along the way. Many people use services, like what my mom is doing, to arrange the trip and have their belongings send from town to town, carrying only what they need for each day. My mom expressed that she was most worried about being away from family and our two dogs for two weeks. Many people who’ve done the trip say the long walk can really mess up your feet, since such a walk is a huge strain on your body! Especially since most people aren’t really used to walking 15-20 miles per day. With the group she’s going with, they’ll do about half of the full Camino this year, and the other half next summer! My mom has been working hard walking about 4-5 hours a day on weekends (as she works full time, too), and since it is a “life-changing event that you go on, a lot of people try to focus on spiritual preparation and prayer… and trying to get to a place where they can take advantage of whatever God has called to transform you during those two weeks”. Since we also just traveled to Europe earlier this summer, and visited the Sistine Chapel and the Vatican, that helped prepare her spiritually and make her even more excited to return to Europe and other important faith monuments a few weeks later. On weekdays, she’s been getting in some extra training on a treadmill at home (which she can put on incline to practice walking all those hills we don’t have in Florida :). Our Aussie-doodle, Maui, has also enjoyed walking on the treadmill. She’s trying to train for her puppy-Camino with her momma! “I’ve been telling all my friends that I’ll carry prayer intentions with me… Since I’ll have, I don’t know, six hours a day to just be walking… And really praying for people who don’t have anyone to pray for them.” My mom always prays or says the rosary while exercising or running, and her and my dad (they’ve been married nearly 29 years!!) make it a point to pray for any intentions that may go un-prayed for. I’ve always admired this, because you never know who might be needing that little extra grace! “I think I’ve just been really blessed to be open to whatever God’s calling is in my life… I feel like there’s some next big time positive that’s coming. I just want to have a very open mind to whatever God wants me to hear. Maybe it’s nothing! Maybe I just come home and I’m totally Zen. Just really going in with an open mind and open heart.” I love this approach! With any challenge or upcoming journey in our lives, I think openness to God’s will is so important! My mom says she thinks it’s good to have a destination in mind (like college graduation), but also says it’s important to just focus on “what do I need to do in the next week? What do I need to do in the next day? If you’re really really stressed out and overwhelmed, and just feel like there’s no way you can continue, just break it down to something smaller… What do I need to worry about in the next two hours? Whatever becomes the manageable place for you to break it down that you can deal with…” What great advice! I’m a BIG-goal-setter (as in, setting lots of goals, but also really big goals) I really struggled with this past spring semester and then prepping for my LSAT, but this advice helped me get through it! She also shared this quote that she and I both love: “Please remember you’re braver than you believe, stronger than you seem, and smarter than you think. – Winnie the Pooh” She shared that she thinks we’re always more capable than we give ourselves credit for! There is always something more God given us, if we believe that we are brave enough and strong enough to tackle that next challenge! She shares so much great advice towards the end of the video, so even if you don’t watch the full thing, I really encourage you to watch those last few minutes! Can I just take another minute to brag on my momma? She wasn’t quite sure how this upcoming journey would relate to ‘my audience’, but every time I’ve watched this video to edit it and write this post, I’m still so amazed by how much goodness and sweet advice she shared!! She’s got quite a few momma-years, and even more Christian-Catholic-years up her sleeve, and she’s where I got my inspo-writing-brain in case ya were wondering ;). Thanks again to my coffee-lovin’-mom for being my first guest for ‘Coffee Chats with Kristen’, and for sharing her story about the Camino and her own faith journey! Comment below if you think she did an awesome job on this lil interview :)!! If you’re reading this, I challenge you to send a text/call to someone you love, who might need a reminder of just how awesome and loved they are! Awh I love this! What a sweet interview! Thanks for doing this interview with your mom! I know your parents from my time as youth minister at St. Paul and I’m excited to follow her journey.